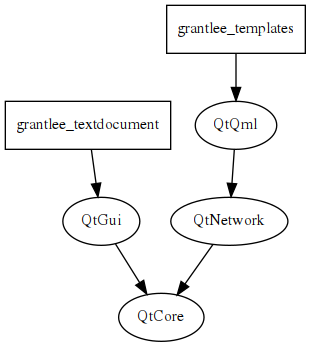 Using Grantlee in Qt applications will often not require much code. Error handling etc is omitted for clarity. In order for the above to work as expected, it is necessary to configure the build system to find Grantlee, and to configure Grantlee to find templates and plugins. Grantlee uses the CMake cross platform build system, and installs a cmake file called Grantlee5Config.cmake. This config file is automatically searched for by CMake and contains the information needed for other CMake based applications to find headers and link against Grantlee libraries. When creating an application using CMake that depends on Grantlee, first issue the find_package command, and then use the CMake target_link_libraries command link to and use the libraries. # ... Application sources etc. Template files can be installed by your application and must later be found by Grantlee so they can be used. If the files are installed on the filesystem, the path they were installed to can be specified when creating a TemplateLoader. It is also possible to compile the templates into a Qt Resource file and set the resource URL on the TemplateLoader. The -root option passed to rcc in CMake causes the templates to be in the virtual filesystem location ":/grantlee/mytemplate.html" etc. This name spacing helps keep independent data in the virtual filesystem separate. If users are able to define their own templates in an application that uses Grantlee for theming for example, the path to the location of such potential templates must also be set through the TemplateLoader. Paths to user defined templates should be defined before default/installed templates so that the user templates are found first. If there is a reason to disallow user overriding of certain templates, they can be specified in a separate TemplateLoader. Additionally, the External binary resources feature could be used to allow savvy users to share themes/templates in a package, or to deploy updated templates easily to existing deployed applications. Grantlee looks for plugins in the paths from the Engines pluginPath property. It does so in the same order they appear there. The default plugin directory of your qt installation (qmake -query QT_INSTALL_PLUGINS). The directories specified in the environment variable QT_PLUGIN_DIR. The default plugin directory of your grantlee installation. Each path has "grantlee/$version/" appended to it, and the resulting directory is searched for plugins. For example, if the version of Grantlee is 0.2 and QCoreApplication::libraryPaths() contains "/usr/lib/plugins/", the directory "/usr/lib/plugins/grantlee/0.2" would be searched for plugins. The search stops when a plugin matching a particular name is found. The paths used to search for plugins can be overriden by using Engine::setPluginPaths. If you just want to add some additional paths use Engine::addPluginPath. The added path will be prepended to the list of search paths. Custom tags and filters can be defined in C++ code or in QtScript. To create a custom C++ plugin it must be built as part of a library and installed in a location known to the application. In this case, my_custom_plugin is a name used for the plugin in the CMake environment. It is used to install the custom library in the install command. custom_plugin_library.cpp is the C++ file where you implement the Grantlee::TagLibaryInterface to return custom tags and filters. The custom tags and filters files are given with the TAGS and FILTERS arguments to the macro. Note that moc is not run on the headers of files given in the FILTERS argument, and is run on the headers of files given in the TAGS argument (custom_tag1.h etc) and on the main library file, in this case custom_plugin_library.h. Note that the PLUGIN_INSTALL_DIR given to the install command should contain the version number of Grantlee used to create the custom library. For example, /usr/share/my_app/plugins/grantlee/0.1/. In C++ code, it is necessary to either instruct the Grantlee::Engine about the location of the plugins or to configure your QCoreApplication::libraryPaths by another standard method. Note that it is possible to define custom versions of built in tags and filters by putting your own plugin library in the path before the path to the default Grantlee plugins. Note that neither the path to the custom libarary nor the path to the Grantlee default library should contain the version number when specified in C++ code with the Engine. The version is only specified when installing the plugin in CMake. Custom tags and filters implemented in QtScript can also be deployed on the file system, or, like template files, can also be deployed in Qt Resource files. In that case, the version should be specified in the -root argument in CMake. Note again that when specifying the path in the virtual filesystem, the version is omitted. User defined filter written in QtScript can also be located similiarly to templates from either the filesystem or the Qt Resource virtual filesystem. The appropriate options may be specified in the cmake gui, or on the command line.